Apr 15, 2018: Financing for suicide prevention does not always come easy. This has moreover sometimes translated to some suicide prevention organisations barely being able to meet the costs associated with conducting related outreaches and workshops. In order to ensure that it keeps its head above water in this regard, the Caribbean Voice – a- not-for-profit Non Governmental Organisation [NGO] – has engaged strategic measures to raise funds. These have included a fundraising raffle which the Caribbean Voice launched yesterday in collaboration with the Giftland Mall. 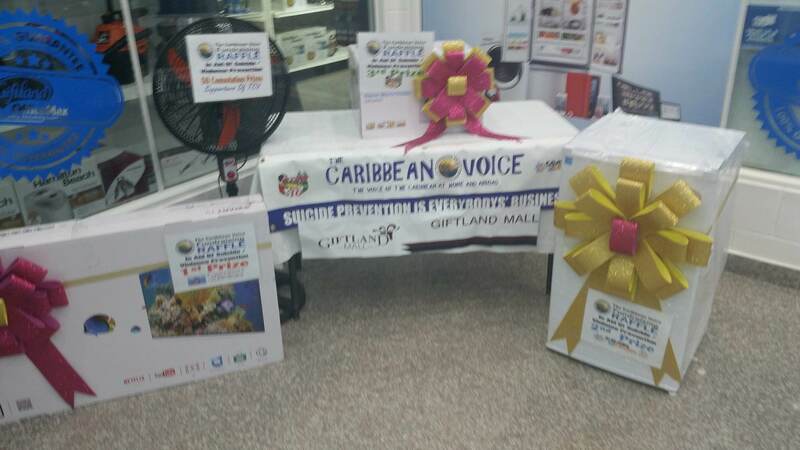 Already the Caribbean Voice has on display at the Giftland Mall, the prizes that are up for grabs on the raffle. “The reason why we wanted to ensure that the prizes are on display, is not only for the publicity that the raffle will attract but we want to assure people who are buying our tickets that the prizes are indeed there long before the raffle is drawn,” said the Caribbean Voice National Coordinator, Mr. Nizam Hussain. The prizes include [First Prize] a flat screen television compliments of Comfort Sleep Mattress; [Second Prize] a small refrigerator compliments of Hussain’s television programme Coast to Coast; [Third Prize] a microwave oven compliments of the Team MMR radio programme; and 50 consolation prizes all valued $5000 or more. The raffle is set to be drawn on July 27, 2018 and will be done live on Hussain’s TVG 28 television programme Coast to Coast. The following day the list of winners will be published in the press. “We are prepared to hand out the prizes as soon as we get the responses,” said Hussain. Tickets, he disclosed, can be purchased from any member of the Caribbean Voice, in all the department stores at the Giftland Mall, the Bagotstown M & M Snackette; on the Essequibo Coast at the W D Hotel and Mart on the Essequibo Coast, Imam Bacchus and Sons and at Patrick’s Shop, Golden Fleece, Essequibo Coast. Persons can also make contact with Hussain on 644-1152 or the Deputy Coordinator, Keshni Rooplall, on 697-9968. It is expected, Hussain said that the funds raised from the raffle will position the Caribbean Voice to bring to reality all of its planned programmes for 2018. “We have a lot of programmes planned for this year [although], our members are volunteers, the logistics involves a lot of money for travelling, to provide the training documents and things like that, so we are appealing to Guyanese to support a worthy cause,” said Hussain. He is convinced that the proactive work of the Caribbean Voice would in fact serve as motivation to donor agencies including government. “We are not overly worried that they [government] might not find time to sponsor us but I do know too that they are doing a lot of work and the finances are difficult to come by,” Hussain added.